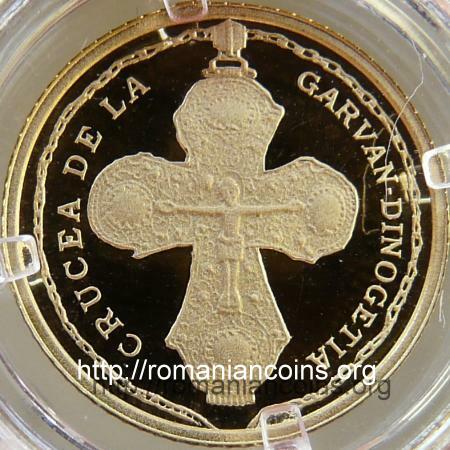 Obverse: ROMANIA, coat of arms of Romania, face value "10 LEI", year 2011, half of the chain of the cross from Dinogeţia - Garvăn, with the clasp Reverse: the cross itself, the other half of the chain (continued from the obverse), inscription "CRUCEA DE LA GARVAN-DINOGETIA" meaning "CROSS FROM GARVAN-DINOGETIA"
The hoard was discovered in 1950, through archeological excavations. The hoard found at Dinogetia also comprise several gold rings (four of them being discovered in 1954) and two silver bracelets. All the pieces were, most probably, made by jewelers from Constantinople. The quality and value of the cross shows that it belonged to a highly ranking person in the civilian or religious hierarchy - maybe to a bishop. The engolpion-reliquary is made from a gold sheet, using the "au repoussé" technique, with filigree adornments. It is adorned with pieces of coloured glass and with semiprecious stones (chalcedony, according to the coin's leaflet, sapphires and opals, after , of only with white and blue stones and with vitreous paste, after ). The cross is 78.5 mm in height and 65 mm wide, tied to a gold chain having a length of 760 mm. Both weigh, over all, 77.46 grams. Inside the cross relics were kept. The cross can be opened through a hinge placed at the end of the lower arm. 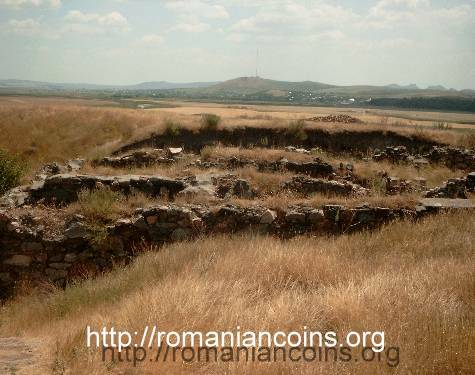 Dinogetia is a very old place, being mentioned by Ptolemy in his Geography, work written in the 2nd century BC. It is placed on a "popina" or "grădişte" - a portion of land raised above the level of Danube's meadow. 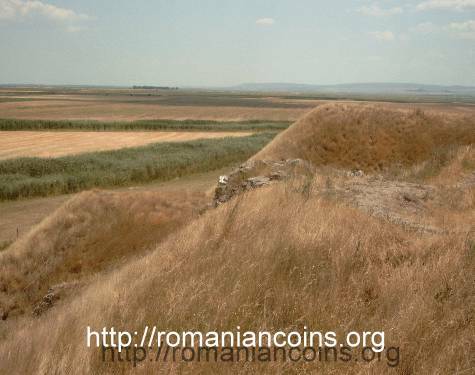 It is placed in the zone of the Danube's bend in front of the mouth of Siret River. The Romans fortified the place in the 1st century BC, when they firmly stretched their rule into the region. During the 3rd and the 4th century AD Dinogetia received new fortifications, with 14 towers and with a much stronger enceinte wall. At the end of the 6th century AD Constantinople has lost the control of the regions, and the troops have left Dinogetia. 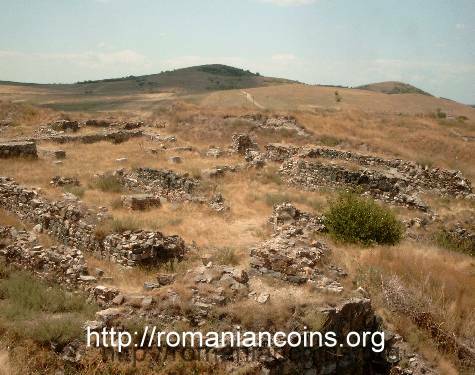 During the 10th-12th centuries AD the fortress was again part of the Byzantine Empire , and there a garrison of Paristrion (Paradunavon) thema was installed. From that period are dating lots of partially buried dwellings that were found - rather earth huts than houses. After the ousting of the Rhomaioi from the region, the fortress lost completely its military importance, the name being named Bisericuţa (Small Church), after the ruined little Byzantine church. The gold cross was hidden of lost during the final period of its Byzantine life. 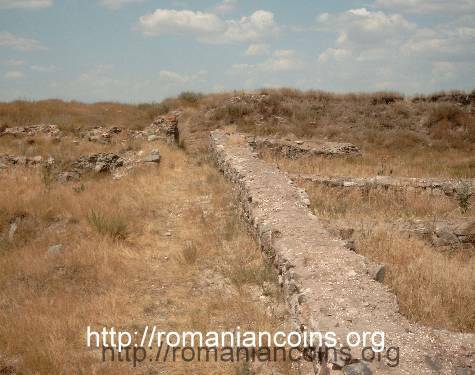 The ruins of the old fortress lie on the territory of Jijila commune in the Tulcea county, near the village of Garvăn. Nowadays Dinogetia does not seem to be placed on an island anymore, but in a not so far from now time was surrounded by water. In the last years of the communist regime the region was drained on a very large scale, and the reclaimed land was used for agriculture; e.g., the great Crapina Lake, placed not far away from Garvăn, has disappeared completely. Dinogetia was studied by archaeologists starting from 1939. 1. Barnea Al., Planul cetăţii Dinogetia (Plan of Dinogetia Fortress). Prospect disponibil la cetate (Leaflet available at the fortress), 2007. 2. Burda Şt., Tezaure de aur din România (Gold Hoards from Romania). Ed. Meridiane, Bucureşti, 1979. 3. 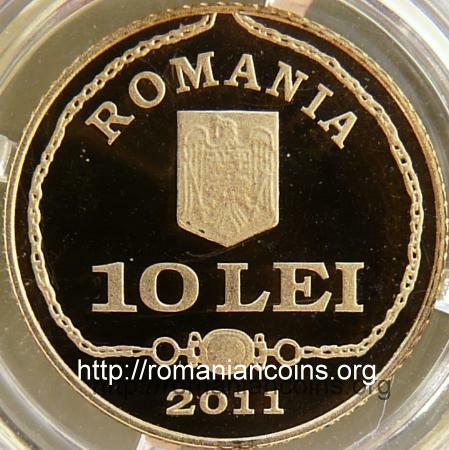 Leahu Doina, Arbunescu Al., Oanţă-Marghitu Rodica, Dumitriu Luminiţa, Mălăncioiu Raluca, Amarie M., Oberländer-Târnoveanu Al., Tezaurul (The Treasury). Ed. Age-Art, w/o year and place.